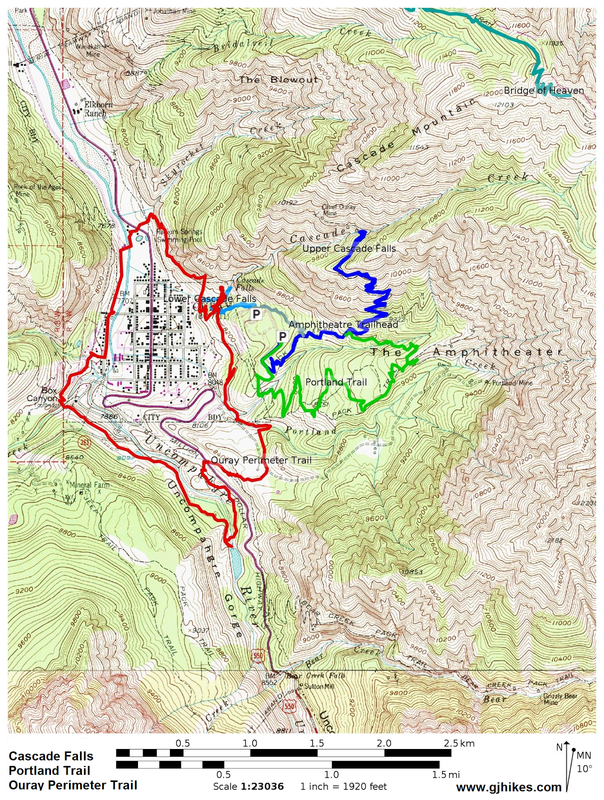 The Portland trail is located in the Uncompahgre National Forest on the southeast side of Ouray, Colorado. The trail climbs through the forested slopes of the Ouray Amphitheatre to a scenic overlook and then comes to an end at a junction with the Upper Cascade Falls trail. 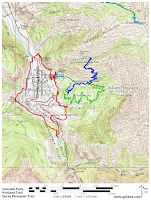 A loop hike can be made by combining the Portland trail with either the Upper Cascade Falls trail or the Portland Mine Road. For this post we begin at the Upper Cascade Falls trailhead in the Amphitheatre Campground and hiked up the Portland trail to the scenic overlook and then looped back to the trailhead on the Upper Cascade Falls trail. The trail starts out by angling up the hill above the campground. As the trail begins leveling off it passes a trail register. Adding your name and information to the trail register will assist Search and Rescue if they end up getting a call for someone on the trail. Continue past the trail register to where the Portland trail begins on the right at about the quarter mile point from the trailhead. This portion of the Portland trail is actually just a spur that connects the Amphitheatre Campground to the main Portland trail which begins at the lower end of the Portland Mine Road. At the 0.38 mile point from the trailhead another junction comes up where we take the left fork of the trail. From the last junction the trail drops down and crosses a branch of Portland Creek which has a seasonal flow. At the time we hiked the trail for this post in the latter part of July the creek was bone dry. This trail junction is at about the 0.63 mile point of the hike. From here the trail begins its steady climb that takes it up the hump of a mountain side in the middle of the Amphitheatre to the ridge where the scenic overlook is. For the most part the trail parallels the Portland Mine Road that is coursing up the canyon to the south of the trail. Several long sweeping switchbacks make the climb an easier task by bringing the trail up the mountain on a much gentler grade that averages only 16 percent. That is pretty tame for the mountainous areas around Ouray. From a couple of vantage points the Portland Mine can be seen on the south side of the Amphitheatre. At the 2.33 mile point of the hike the trail reaches the scenic overlook. Most of what you can see is the Amphitheatre itself. Everything to west towards Ouray is blocked by tall trees. Just past the scenic overlook at the 2.4 mile point the trail comes to another junction. At this point a spur trail breaks off on the right that leads down to the Portland Mine Road. Take the left fork though to continue following the Portland trail to its end at the Upper Cascade Falls trail. This last half mile section of the trail continues to be a pleasant hike that trends mostly in the downhill direction. We were lucky enough to find enough chanterelle mushrooms to fill our small bag. We left plenty for anyone else that comes along and could have obtained many more if we would have ventured off the trail a little. If you are new to mushroom hunting be sure to not pick anything that you can't positively identify and then only eat a small portion at first to see how you react to it. A good place to start is too learn the deadly mushrooms first so you know what to avoid for sure. At the 3.2 mile point the Portland trail comes to an end at the Upper Cascade Falls trail. From here it is a pretty easy downhill hike back to the trailhead. Rather than completing the traditional loop back to where we first got on the Portland trail we jumped off near the bottom of the Upper Cascade Falls trail onto the connector trail that leads to the Amphitheatre Picnic Area and then hiked the short distance from there back up the road to our vehicle. It was an easy way to hike the connector to get the GPS track for our map. A person could just as easily begin the hike at the lower trailhead on the Portland Mine Road. The round trip distance comes out to be about the same no matter which place you begin at. 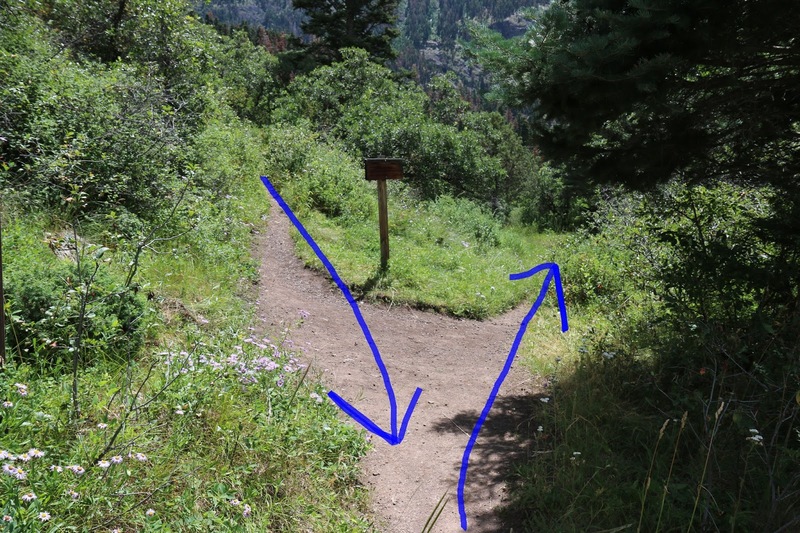 The elevation gain would be a few hundred feet more from the lower trailhead but if you are hiking around Ouray you probably aren't concerned all that much with elevation gain. In Ouray pretty much everything is up when it comes to hiking. Initially we had given the Portland trail a 4 star rating because it seemed so pleasant to hike but for whatever reason we changed it to 3 stars. If you would like to see it for yourself then all you have to do is 'Take a hike'.